Obituary for Vina A. (Corona) Aini | DeMarco-Stone Funeral Home Inc.
Schenectady - Vina A. Aini, 88, formerly of Schenectady entered into eternal rest on Monday, January 28, at the Fulton County Nursing Home in Gloversville, NY. Born in Cohoes, NY on February 3, 1930, she was the daughter of the late Delida (Gristini) Corona and Emilio Corona. Vina was a communicant of St. Paul the Apostle Church in Schenectady and a member of St. Paul’s Rosary Society. She was blessed with six children and despite being born with physical limitations, she showered her children with loving care. Vina is predeceased by her beloved husband of 33 years John M. Aini Sr. whom she married on June 4, 1950, her treasured sons Mark J. Aini, John M. Aini Jr. and her granddaughter Karen Segretto. She is also predeceased by her sister Vera Cortez. She is survived by her siblings Mary Ann Gould and Andre (Carol) Corona, her remaining children Anthony (Cheryl) Aini, Catherine (Victor) Jakway, Margaret Aini-Mercier and Patricia Aini, her daughter-in-law Mini Aini, her cousin Grace and many nieces and nephews. Vina cherished her 13 grandchildren often saying that she should have had them first! After having six children she could hand them back especially with a dirty diaper! The hours that she spent babysitting, taking day trips and teaching them values fulfilled her days. The Lord shined upon the family giving her 21 great-grandchildren ranging in age from adulthood to a recent newborn. She instilled Catholic faith in her whole family. They sat in the same seats and it is still remembered as the Aini pew. She loved singing silly Italian songs to her grandchildren, planting spring flowers, hanging laundry outside, making her delicious soups, pasta sauce and meatballs, preparing holiday dinners for her large family especially at Thanksgiving doing the turkey dance. She loved Almond Joy candy bars and Chianti wine. Vina had many hobbies but bowling in a weekly league was her favorite. She had a special place in her heart for the many cats and dogs that she tenderly cared for. She attended Alfred State College where she met her loving husband. Vina worked in several capital region hospitals in their labs prior to having her six children. 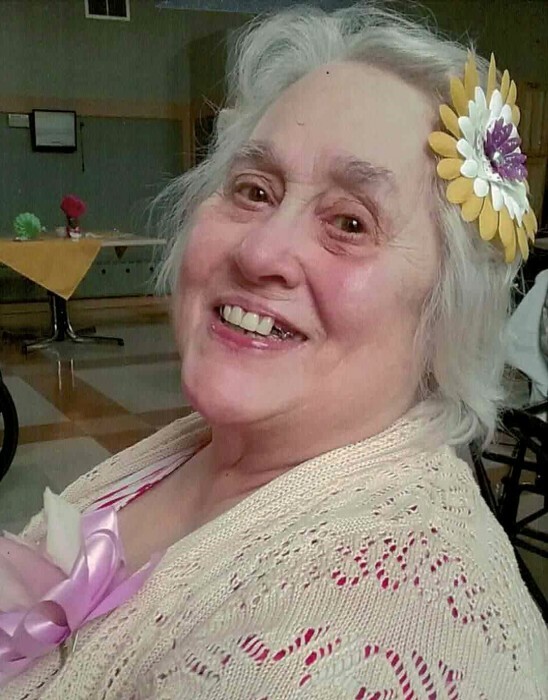 She was a library clerk for the Schenectady County Public Library for many years until her retirement and she loved to read stacks of books often found asleep with an open one. Calling hours will be held Thursday January 31, 2019 from 4 to 7 pm at Demarco Stone Funeral Home, Helderberg Ave, Schenectady. A mass of Christian burial will be celebrated at St. Paul the Apostle Church on Friday, February 1, 2019 at 11 am. Burial will follow at St. Joseph’s Cemetery, Albany Street and Kings Road. The family extends its deepest thanks and gratitude to the loving and dedicated nurses and staff of the Fulton County Nursing Home. Vina’s last 5 years were made enjoyable and meaningful. In lieu of flowers, memorial contributions may be made to St. Paul’s Rosary Society.